SkinCerity.....Getting In Your Business! with Brigit ........ the "SkinnyGirl"
Medical Breakthough in Skin Care! Become A Distributor! Join Today! Welcome to Skincerity by NuCerity! Get The Skinny with Brigit! Brigit aka SkinnyGirl here! I am a single Mom of 2 wonderful children Arielle (7) and Brendyn (17). I guess by now you can imagine my stress! I love coaching people about their skin and starting their NuCerity business! Feel free to contact me for more info! (205)337-9289 Also visit me on You Tube for the SkinnyGirl Mini Episode Stories! 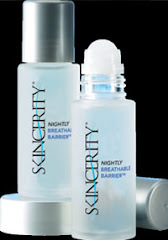 SkinCerity was created to treat skin cancer recovery care. Partially funded by the federal government ( I hear a cool 7 mill) the company had a desire to create a new product in the form of a barrier or mask to be applied at cancer sites in order to hold medicinal ointments and lotions in place. Not only would it help facilitate deep treatment of the effected area, it would also needed to be antiseptic in order to maintain the integrity of the medicinal products used beneath. SkinCerity achieved both these aims and in addition to this, as an added value, it also improved skin texture and health in the treated areas…. I see a beauty perk coming!